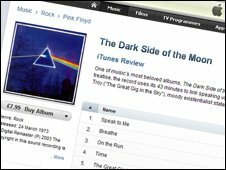 Pink Floyd tracks may be removed from digital music services like iTunes after a High Court ruling. Their latest record deal, signed with EMI before legal downloads came along, said individual songs must not be sold without the band's permission. They argued that the same rule should apply to digital sales as well as CDs. EMI disagreed but a judge has sided with Pink Floyd. The ruling is part of a long-running battle between the two sides over £10m in unpaid royalties. EMI said it had not yet been ordered to stop selling single Pink Floyd tracks. That may come at a later stage in the case, however. In court, Chancellor Sir Andrew Morritt said the contract contained a clause to "preserve the artistic integrity of the albums". He said the contract meant EMI were "not entitled to exploit recording by online distribution or by any other means other than the original album, without the consent of Pink Floyd". EMI has been ordered to pay £40,000 ($60,000) costs. The band were not present to hear the judgment at the High Court in London. An EMI statement said: "Today's judgment does not require EMI to cease making Pink Floyd's catalogue available as single track downloads, and EMI continues to sell Pink Floyd's music digitally and in other formats. "This litigation has been running for well over a year and most of its points have already been settled. 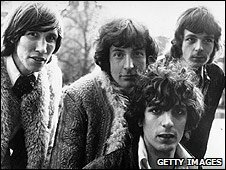 "This week's court hearing was around the interpretation of two contractual points, both linked to the digital sale of Pink Floyd's music. But there are further arguments to be heard on this and the case will go on for some time." Earlier this week, Robert Howe QC, appearing for the group, said the the band's deal with EMI stipulated that their "seamless" albums should not be split up and that they "wanted to retain artistic control". Elizabeth Jones QC, appearing for EMI, disagreed and said the word "record" in the band's contract "plainly applies to the physical thing - there is nothing to suggest it applies to online distribution". The issue of selling individual tracks online has been a thorny one for many artists, who want their albums to be seen as complete works. Bands also receive less money if fans pick and choose tracks instead of buying a full suite of songs. It is believed to be one reason why The Beatles - whose catalogue is also owned by EMI - have not appeared in download stores like iTunes. Garth Brooks and AC/DC are among the others who have objected to their albums being split up. Peter Jenner, who managed Pink Floyd when they first signed with EMI in the 1960s, said releasing complete albums was important to the band. "Clearly in cases like the Floyd, there was a coherence in the content as an album," he told BBC 6 Music. "Tracks were dropped because they didn't fit in with the whole thing. I think that was quite common, especially in the 70s and 80s." Mr Jenner, now emeritus president of the International Music Managers' Forum, predicted that the ruling would be significant. "I think it will give the artists some ammunition to get the record companies to be a bit fairer with the royalty treatment they give artists for digital work."